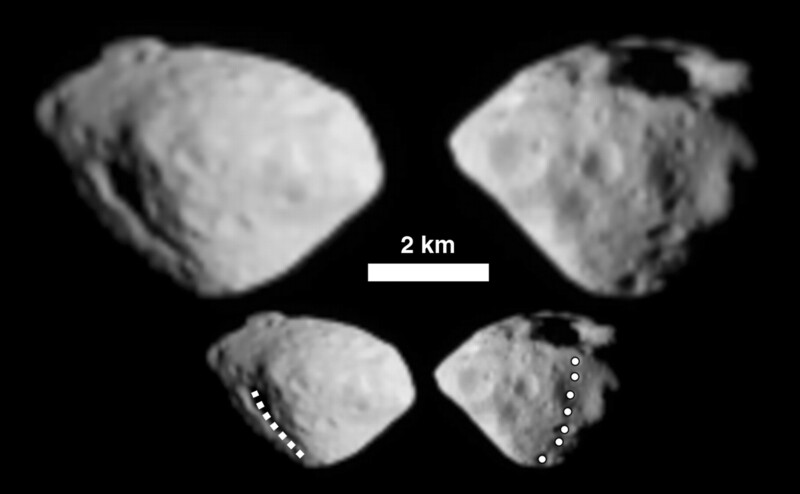 The images of asteroid (2867) Steins were taken with OSIRIS wide-angle (WAC) and narrow-angle (NAC) cameras onboard Rosetta during the flyby of 5 September 2008. This is the first time that a close-up view of an E-type asteroid has been obtained. The closest approach (CA) to the asteroid was at 18:38:20 UTC at a distance of 803 km. About 60 per cent of the surface was resolved during the flyby providing a unique set of images from which a number of important physical properties can be inferred. The WAC image (top right) taken around CA at a phase angle of 61.5° shows the surface of Steins at a resolution of 80 m/pixel. The NAC image (top left) taken 10 min before CA has a slightly lower resolution of 100 m/pixel. The scale is given by the 2-km bar. The difference in viewing angle between the images is 91°, so they show opposite sides of the body. Celestial north is up. A large crater is visible near the south pole; Steins's rotation is retrograde and therefore its north pole points toward the celestial south according to IAU rules. The positions of the catena with the seven pits (bottom right image) and of the large fault on the opposite side (bottom left image) are indicated.